When I first joined the Ectopic Pregnancy Trust message board fifteen or so years ago, there was a special, shining light on the board, guiding people through the tough times, making us smile with her wicked sense of humour, and giving us practical, sound information. Sarahg (as she was known on the boards, and always will be to me) was then working for the Trust as a message board coordinator, having been through her own losses and pain. In that role, she touched not just my life, but the lives of hundreds of other women. To say she touched my life though is a major understatement. She enveloped me - all of us - in a huge, comforting hug. This isn't the first time I've mentioned her. I talked about her here, when I commented that the best people I know were women without children. She has continued to inspire me, facing additional difficulties with courage and spirit. I’m so proud she’s my friend, and so pleased I can introduce her to you. I asked her to write something for my blog, and - as my first ever internet contact - it seems appropriate that she is the first to do so. “Ironically, next month it'll be 20 years since my first ever pregnancy. I always wanted to be a Mum. It was my biggest ambition, something I instinctively believed I'd be good at. I met my husband when I was 20, we married when I was 23 and moved to the opposite side of the country from our families following job opportunities - yes, we 'got on our bikes.' We bought a one-bedroomed house which promptly turned to poop as the market crashed leaving us stuck paying 15% interest for a house in negative equity. Yes, kids, that's 15%! Our mortgage payment was equivalent to my monthly wage. After a shed load of hard work and five years, we managed to move to a bigger place so finally we could start a family. Three years later the pregnancy test showed a faint positive. I went weak at the knees and felt physically shocked with fear and excitement. My husband was thrilled. My in-laws were delighted, my Dad was chuffed. My Mum was a picture of worry. My sister was already leaving the first trimester of her pregnancy. Wow, how cool was that, cousins close in age! Here the story turns upside down. Misdiagnosis after misdiagnosis - I finally ended up in hospital having my ruptured fallopian tube removed along with my precious baby. Scroll on almost five years, and I am back in hospital two weeks before Christmas, losing my second baby and my remaining fallopian tube. Everything I had hoped for and dreamed of had evaporated. Alienated, confused, grieving, hurting, desperate. No blueprint, no idea what to do, cut adrift. I began searching for answers, and in 2002 stumbled upon a new-fangled message board on the internet, a place for other women who'd also experienced what I was going through. I was hooked, addicted to chatting and unpicking what was happening to us. I found myself and my purpose. My life hasn't turned out the way I expected. We decided neither IVF nor adoption was for us. They were hard decisions. We knew they were the right ones for us. My biggest fear was how it would hit me after menopause. With typical predictability, it came early, and although I did ask myself if I had regrets, the truth is I know I did the right thing. So for me, no regrets. My happy ending has required a massive rewrite - it has been very hard. However, I've stopped leaving my happiness to chance, stopped waiting and started to live my life to the best of my ability. I have met so many extraordinary women, my peers, people who understand what it's like because they've walked in my shoes. People who share the deepest pain and the most exquisite joy of being able to laugh again, laugh at ourselves. I feel alive. I would never have worked with teenagers if not for my losses. Worked with amazing colleagues who will always be my friends. 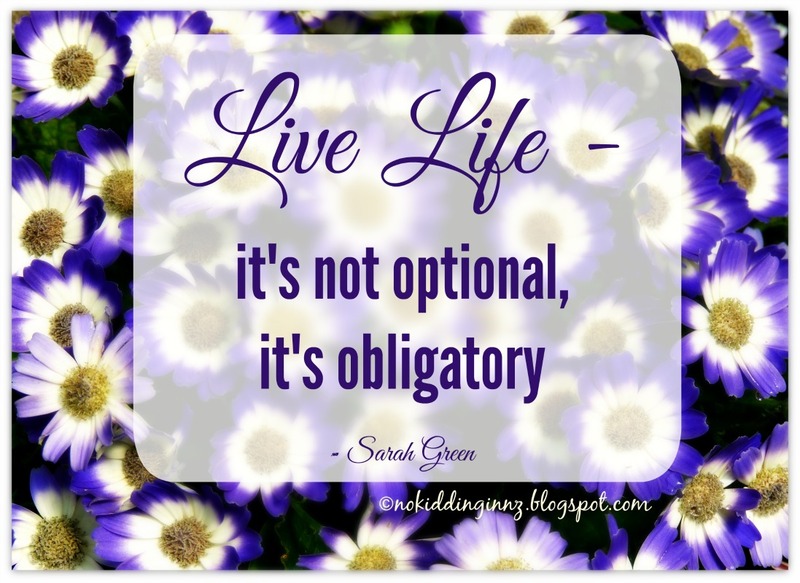 Live life, it's not optional, it's obligatory. Cry uninhibited with those who are hurting. Don't go through life holding your breath, waiting to be saved, hoping for that metaphorical white knight. Be your own hero. 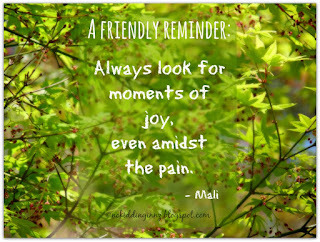 I often talk about the importance of finding joy amidst grief and loss, and apologise if I am too repetitive. For me, the momentary pleasure of a rush of joy or bursting into laughter or feeling love is very important when I am feeling sad or alone. It connects me to others through laughter or love, to nature when I see or smell or hear something beautiful, and to myself, simply by recognising I can still feel joy. One of the hardest times in my life, when I was in hospital with my second ectopic, when it seemed it would never resolve and there was a prospect it had turned cancerous, almost always brings memories of the brilliance of the red flowers on the pohutukawa trees by the hospital carpark. I could see them from my hospital room, and took pleasure in the blooms, just as whenever I see cherry blossoms now, I remember how they gave me moments of joy during the days of visiting the hospice and sitting with my father as he was dying. The joy doesn’t mean the pain isn’t there, or that it goes away never to return. 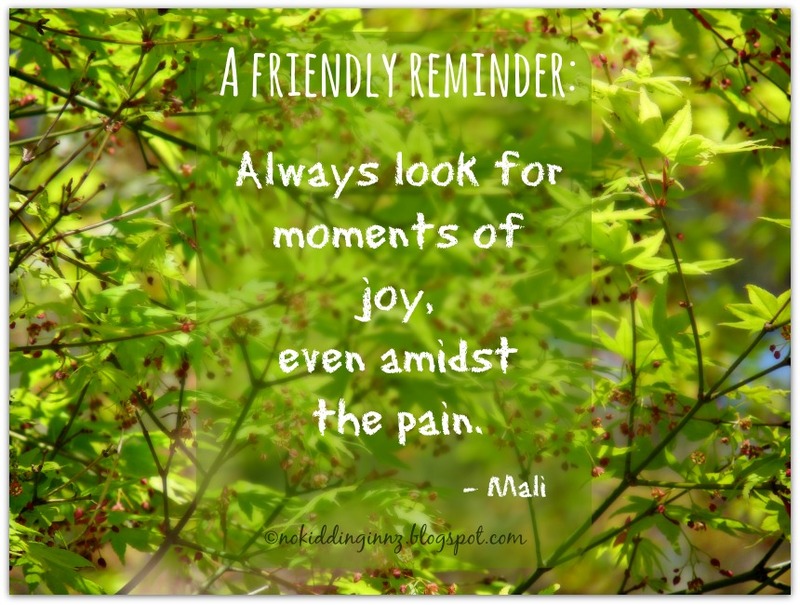 But joy provides a blessed moment of relief from pain. It is a promise that I can feel happiness, and will again. If I’m repetitive here, perhaps it is because I need to remind myself regularly that there is always joy in this life, and I should never forget to look for it. This time of year, Loribeth is the Queen of Memes. Her Year in Review is always interesting. I did it in 2013, but the last two years I’ve started to do it and stopped, because I sounded (and felt) way too negative. Yes, I’ve been in a bit of a end of year/New Year funk. This one, though, was going to be easier to complete - so I’m unashamedly copying her, just because it’s a bit of fun, I feel much more positive now than I did a few weeks ago (even though nothing has materially changed). Also, it's an important reminder that we are so much more than our infertility. Reading: Marlon James’ A Brief History of Seven Killings. It won the Man Booker Prize, and I’ve managed to borrow it from the library, but it is not a quick easy read, and so I’ve already had to return it and then borrow again. (An extension wasn’t possible). I’m hoping to finish it in the next couple of weeks, but won’t be surprised if it takes me longer. It is satisfying reading though, taking me to a completely different time and place. Listening: As usual, I'm listening to RNZ National. I spent the first few weeks of January dipping in and out of the Matinee Idle guys, who are hilarious. Now it’s back to regular programming, and I’m being a bit more choosy. Following: Many international friends on Fb, including one on his visit home to Thailand, and another who is sitting at the bedside of her dying father. I feel for her, knowing it may not be long till I will be doing something similar. Drinking: Summer wines – rosés and sauvignon blancs. We don’t always drink these a lot during the winter, so I’m loving trying different brands. Two Rivers has produced some lovely wines this year (both rosé and sauvignon blanc), and the Tuki sav blanc has quickly become a favourite. Eating: I'm loving the summer fruit – the berries (sadly, as they’re my favourites) are ending, but the stone fruit is all coming in now. And I'm also having my usual love affair with summer vegetables, especially all the fresh tomatoes and cherry tomatoes, but also the aubergines and zucchini and capsicums (sweet peppers). I tend to buy seasonally, so rarely buy these vegetables in the winter, even when they’re available. Anticipating: Some not very good things. Trying to be prepared, yet trying not to stress either. Contemplating: My motivations. How I want to spend the next ten-fifteen years of my life. You know, just the little questions in life! Loving: The summer weather – not that it’s been a great summer at all, it hasn’t! Just the freedom that comes with slightly warmer temperatures, the way my shoulders relax and my head is held a little higher. I read somewhere recently that goal-setting is demotivational – when you don’t achieve your goals, you feel like a failure. I immediately thought about the goal-setting we indulge in (and torture ourselves with) throughout infertility. We set arbitrary goals – "I want to be pregnant by the time I’m <insert age here>" - or we look at milestones, and say, “I want to be pregnant/have a baby by next birthday/New Year.” Is it any wonder that when we don’t reach these goals, we feel like failures? It's almost inevitable, I think, that we take this feeling of failure into our new, no kidding lives, and then set new goals that may or may not be achievable, setting us up for more failure. Or perhaps, we feel cast adrift, lost and alone, when we don’t even know which goals to set. I know though, that since I have decided to try to appreciate the good in my life, even in the difficult times finding joy and love and knowledge and understanding, life has been easier. As a result, I am better able to cope with, and perhaps, better equipped to achieve in other areas of my life – just without too many of those demotivational, arbitrary goals. I've talked often about the women I met on the ectopic website's messageboards, the women who helped me through my two ectopics, those who continued with me on the journey of not having children, and those amazing women who volunteered with me. Recently, I flagged with some of these women the idea of them becoming involved in guest posts here, and within minutes had positive responses, and tears running down my face. Watch this space for posts, interviews, chats with some women who have been through a lot, and come out on the other side. No Kidding in NZ wouldn't be what it is, might not even exist, if not for these women. I've chatted with one of these wonderful women about blogging from time to time. She's got a great way with words, a wicked sense of humour, and real insight into other people. 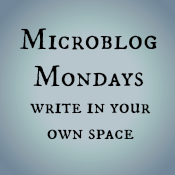 Well, this prompt motivated her, and she's just started her new blog, it's inconceivable. Go visit and say hi! I have a blogging friend who is a fantastic teacher. I wish I'd had a teacher like her. Her students adore her, know that she listens to them and that she sees them, truly and deeply. She acknowledges their existence and treasures their uniqueness. For some of them, this is the first time they actually feel heard, feel really understood, by an adult. Their parents see them primarily as their children, not always as real, unique, human beings. Other teachers might ignore them or let them just slip by. My friend commented that, in general, “adults don't get to know children, beyond their own children.” You can read her entire post here. It's worth it. I have addressed this idea previously when I wrote about my relationships with my own aunts, and now with my nieces, in my post on the joy of being an aunt when you don’t have children of your own. I never had an individual, one-on-one relationship with an aunt, though as an adult, when I first moved to this city, I got to know the aunt-from-another-planet more as an individual, and I think she got to know me more too. If only she'd been around when I was younger, she could have been a great mentor. I think I needed one. As I've contemplated life as an aunt (in the family, or as an honorary aunt), and a never-to-be mother, and as my relationships with my nieces have grown, I've realised that this relationship is unfortunately not the norm. To have these relationships, parents need to see that there is value in it for their children. I don't always see that, and I don't want to "push in." Perhaps part of society's emphasis on the nuclear family, or the societal isolation of people without children, I find that parents can be quite possessive about their children, holding them too close, and not inviting others in. I can think of several motivations for this, but the outcome, I think, is sad for everyone. Parents miss out on a wider support network. Children miss out on learning and growing in different ways. We miss out on sharing our experiences and love. The reality is that children have enough love for everyone. They're not going to love their parents less, simply because they love their aunts or uncles. They're going to be happy and open, and their world will expand. So I feel rather sorry for those children who don't or have never had an aunt (or uncle) who understood them, who could mentor them, who might see the world differently than their parents, or have different experiences that she (he) could share with them. I feel sad that I can't have that relationship with more children/young people, as so many of my nieces and nephews grow up overseas. I think of friends who don't have the chance to have this relationship at all. Not all of us can. Many people will tritely say that we should surround ourselves with children, but it's not always that easy. I feel sorry too, for the mothers who miss out on playing that role, but simply don't have the time or energy to give. A comment on my previous post noted, " Now I have my own child, I really miss my special time with my nieces and nephews." I think too, that the relationship is a special one, because mostly, it's a role of love and joy and connection, rather than of duty, responsibility, or stress. I have wondered too, if in extolling the virtues of fabulous aunties, I'm just trying to boost myself, to make myself feel better about not being a mother. So I was really glad to see that my friend expressed similar thoughts to mine about adults interacting with young people - or not. Perhaps particularly, I felt pleased to see my view validated by a teacher, someone who is experienced in working with children and their parents. Back to my point (and my friend’s point). Adults don’t tend to get to know children other than their own. And even then, some of them don’t really get to know their own. She didn’t say, “as a mother …” and I love her for that. She is wiser than that. I wish everyone was. She emphasised simply our shared humanity. So often, this is forgotten. But I digress again - apologies! In our relationships with people of younger generations, perhaps as an aunt or uncle (by blood or marriage, or through friendship as an honorary aunt/uncle), I think that we are privileged to be able to hear their thoughts or dreams, their hurts and their hopes. No, it is not the same as having my own, but that's exactly the point. It's different. And it's not all about me. It's about them. If I can give them something they don't get in their relationships with other adults, then that is a privilege. I feel very grateful to have these relationships, even if I see these special people only once a year (if that often). I’m learning, too, to feel grateful for playing a part in their lives, at a time when they need it. I'm learning not to feel hurt if our relationship alters as they grow and change and become more independent, establishing their own support networks, spreading their wings, hopefully with a little bit more wisdom or self-belief or courage as a result of my relationship with them. I see them. I saw them. I see them still even though they may no longer need me as much. In turn, they have seen me, too. And that really is a gift. This time last year, I was reading Mel's last ever Creme de la Creme list, a list where bloggers nominated their favourite post of the year. This year, she invited people to comment here with their favourite post of the year. I encourage you to read the comments, and click over to some really moving and important posts. A year ago, I posted about the process I took in choosing the one post I'd submit to the Creme list, listing the posts I'd considered to be my best. This year, even though there isn't an official Creme, I didn't go through such a detailed process. I chose the post that had the most views, and that was, perhaps, the most important of those I wrote last year. Still, there were a number of other contenders. There were posts that had a lot of readers or comments, and there were a few that were personal favourites, posts that meant (and still mean) a lot to me. They're important to me, because I know what I went through before I could even begin to write that post. Or I know how important these aspects were to my long-term healing. As it’s the first day of the New Year, I thought it might be timely to make some No Kidding resolutions. I don’t always make resolutions in a formal way, but I always – whether it is January 1st or the middle of July – have a list of things I want to do better. That is also the case when it comes to a) living my No Kidding life, and b) blogging about it. Remember to cross-post to BlogHer (and learn more about how it works). Be grateful for those who read and comment, even if we disagree (maybe especially if we disagree). Be brave – when blogging, writing, and in life.